Fire burned 11 houses on Jalan Inspeksi Cakung, RT 01/09, Cakung Barat Urban Village, Cakung. Fire has been extinguished by personnel on Monday (2/12). There is no casualties in this incident. "It is allegedly caused by short circuit. 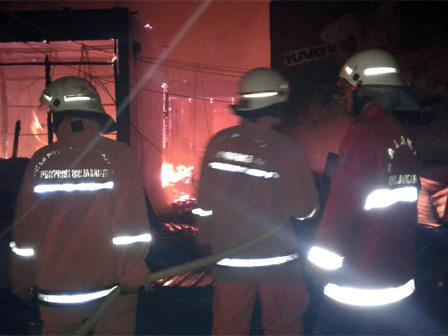 There is no casualties or injured parties"
East Jakarta Fire Handling and Rescue Sub-dept. 's Fire Control and Rescue Section Head, Gatot Sulaiman mentioned, this fire incident is allegedly caused short circuit. Source of fire is suspected came from house owned by Jasih (40) around 2.30 AM. "It is allegedly caused by short circuit. There is no casualties or injured parties. But house owner has suffered material loss around Rp 600 million," he informed. His side deployed 12 fire trucks and fire was completely extinguished at 3.30 AM or within an hour. According to him, from 11 burned houses, 10 of them are rented houses. Because of this fire incident, 11 families or 65 people don't have a place to live for now. Fire location is still guarded by police line installation. This fire case is handled by Cakung Police Sector.